The mysterious Mr. King — and why did he hate my guts? IN MY UNENDING and thankless quest to rid my home of clutter, I came across my high school and junior high report cards. Why I’ve saved those, I have no idea. 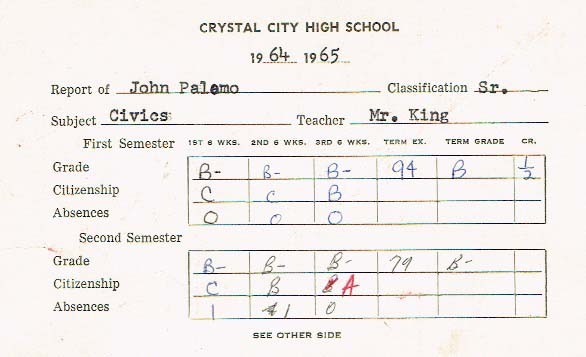 There is nothing remarkable about my report cards (aside from the fact that I was “John” Palomo in high school!). I was a fairly good student so I made primarily A’s and B’s, with a few C’s here and there, mostly for my science classes. My worst grades were in chemistry, biology and physics. My best were in English. The only card with perfect grades was for my plane geometry in which I made perfect scores in every single assignment and every single exam. I loved the beauty and logic of plane geometry and I wished that all my classes were like that. My mother probably did see many of my report cards, at least in elementary and junior high schools. By the time I was in high school, however, I decided I didn’t need to bother her with signing my cards and started forging my father’s signature. Sometimes hers. I got pretty good at replicating their signatures. I think the main reason was that showing her my cards with their mostly good grades was tantamount to bragging, and if we were taught anything early on it was that we should never brag. THERE WAS ONE report card, however, that stands out. It is my civics class in my senior year. I earned a B on my work, but when it comes to citizenship, I had C’s during the first two six-week reporting periods of the first semester and a B in the third period. In the second semester, I started up with a C, followed by a B and then, finally, an A in the final six weeks. I am mystified as to how that happened. I was a good student, for the most part; I behaved. I never skipped classes and I always completed my assignments. In no other class in my four years of high school did I ever get anything less than an A.
I can’t imagine what I might have done that demonstrated to the teacher that I had a bad attitude or that I would not cooperate. Especially in civics, one of my favorite topics in high school. I loved government and I was fascinated by politics. The teacher’s name, according to the card, was Mr. King. I think I vaguely remember him. He was a youngish, fairly good-looking guy – probably a coach. I have vivid memories of all my other teachers. The excellent ones as well as the lousy ones, and can probably come up with an anecdote of each of my classes. But not about this Mr. King. Obviously, he wasn’t that important to me. I just looked him up in my yearbook and he doesn’t look at all like I thought he did. His first name was Walter. Was that why I misbehaved? Because I didn’t respect him? I know that I tended to care more about my classes and about my grades in classes where I respected my teachers. Why would I not have respected Mr. King? And why did my citizenship grade go from C during the first six-weeks of the second semester to an A? The card shows that he initially gave me a B but then he crossed it out and replaced it with an A. Did he feel sorry for me? Or did I suddenly become a good school citizen? I GUESS IT all shall remain a mystery. We can call it Citizen Juan. Or The Mystery of Mr. King. This entry was posted in Uncategorized and tagged citizenship, Crystal City, grades, high school, Southwest Texas Junior College, teachers, Tomas Rivera. Bookmark the permalink. 1 Response to The mysterious Mr. King — and why did he hate my guts? pleasant to read this web site, and I used to pay a visit this blog everyday.